Lough Tay is a scenic lake nestled deep in the Wicklow mountains,and surrounded by stunning scenery, making it one of the most photographed locations in the Garden of Ireland. The mountains and lake offer a spectacular panoramic scene that is best viewed from above. It’s dramatic unspoilt setting made it an ideal choice for filming many of the outdoor scenes on the History Channel’s television drama Vikings. 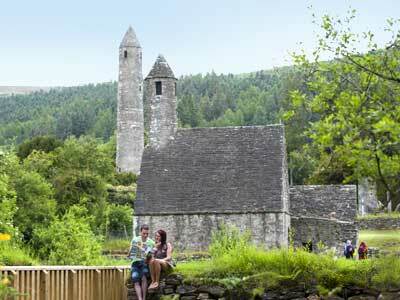 Glendalough in the heart of the Wicklow Mountains National Park. The stunning landscape, historic ruins and beautiful walks have made it one of the most popular tourist destinations in Ireland with over 1 million visitors each year.